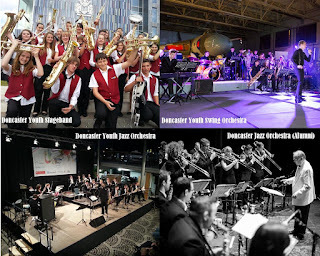 Over the years, this big band knees-up has definitely become the most eagerly-anticipated event of the Doncaster Youth Jazz Association calendar. All current DYJA members will perform in their respective ensembles. The individual Big Bands are featured in order over two separate concerts as follows: The matinee performance (2.00pm - 4.30pm) will feature the talented younger members of the STAGEBAND and the SWING ORCHESTRA. The evening performance (7.30 - 11.00pm) will highlight the DONCASTER YOUTH JAZZ ORCHESTRA (DYJO) and the senior DONCASTER JAZZ ORCHESTRA (DJO Alumni) in concert. The evening will also feature several visiting guests, including Dennis Rollins, Tom Ashe, Dean Nixon, etc..
We take this opportunity to wish you all a very Merry Christmas and a MUSICAL 2016!... May it start with us - we hope to see you at our Big Band Festival! Tickets are now available from the Doncaster Jazz Centre, Beckett Road, Doncaster, DN2 4AA. Tel: 01302 320002 or e-mail johnellis@dyja.info Please give your full name, postal address and state clearly which of the 2 concerts you require tickets for. We do not have the facility for payment by card, so please make cheques payable to DONCASTER YOUTH JAZZ ASSOCIATION or DYJA. You can of course collect tickets from the Centre Office if you wish, but be sure to arrange a mutually agreeable day and time. Thank you for your understanding.